Do not drink and drive....not even boats. 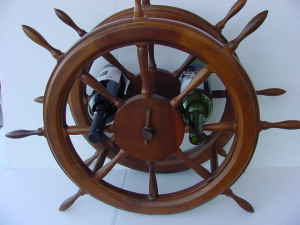 Or maybe don't store your wine in the wheel. theAd>>England's Rose, Princess Diana Knife. A gift from my grandmother in England. Well I am sure it is in excellent condition. What, are you going to wear it out...from use....when would you use this and for what? Throw it in the fishing kit, mmmm, no. 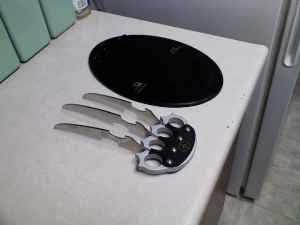 I would think you would want to save this for your formal knifing needs and since there is no such thing......I am sure it is in pristine condition. 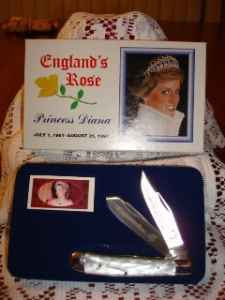 And what makes this a Princess Diana Knife? Does it resemble Diana? Is this the kind of blade Diana carried? Is it okay to blame your grandmum for your dumb post? [That last question was more of a judgment than a question in case you did not catch the subtlety]. Will make someone a great x-mas gift! Wow that IS a great gift! I would love to get $1500 for Christmas. "Sportsman Green" Is that what the kids are calling it? I prefer dough, moolah, rhino, spondulicks and debloons, but whatever you call it, I really like cash. I honestly do not care how many hours my green has been used or what year it was minted. One thing is for sure...if you give me 1500 bucks....it won't last long. theAd>>Brand new, never personally opened. This WaMu teller doll will revive all of your old Washington Mutual banking memories. The bank is no more, but the memories will live on through this superb action figure! Great gift for someone who has worked at the bank that was responsible for the greatest financial collapse in the history of humankind! I am not clear if they produced these to sell or give away. Here is what is a GREAT idea. The placement of the "look whats inside" arrow. Teller is packin' some heat! "Ready for action" is right! Labels: Fun?, Makes a Great Gift? theAd>>Decorative pitch fork has a beautiful patina. It measures 68.5"h x17" wide across top. At the base of the fork is a tightly stitched leather strip. Strong enough to pitch your hay with or just use as an attractive country wall decoration. Sheesh...watch an old movie once in a while. Oh what? that was Frankenstein's monster, not a publicly elected official? Obvious mistake.